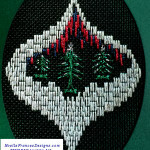 Northern Lights and Evergreen Trees is a 59w x 69h counted needlework design that uses Kreinik Metallics and Caron Watercolour threads. 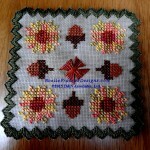 This design was placed in a tri-fold window card. 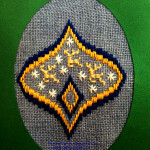 Reindeer on a Starry Night is a 65w x 77h counted needlework based on a Bargello Pomegranate design. 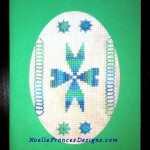 This design was placed in a tri-fold window card.